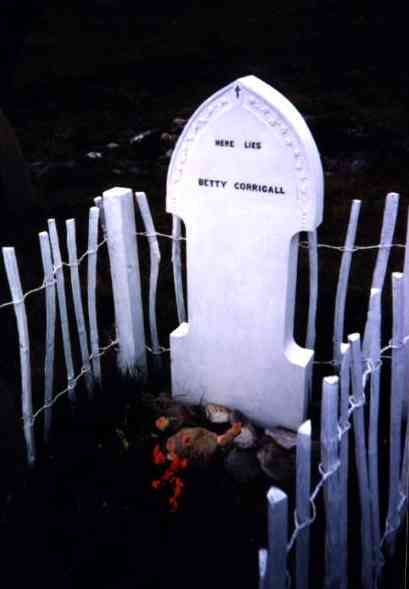 Betty Corrigall's grave provides the unsuspecting visitor with a surprise. Only upon close inspection does it give up its secret .... the headstone is made out of fibreglass. The reason behind this phenomenon is but one of series of misfortunes that have beset this isolated interment since the original burial late in the eighteenth century. Betty lived at Greengairs Cottage near Rysa on Hoy. Aged about 27 she fell for a sailor, and after a brief romance he returned to the whaling, leaving her both deserted and pregnant. In desperation she attempted suicide by walking into the sea, but this action was thwarted when she was seen by a passing local who dragged her out and comforted her. This was to be a short lived reprieve however, for shortly afterwards she successfully hanged herself in a nearby barn. According to their rights, the Lairds of Hoy and Melsetter refused to have her body on their lands and she was eventually buried far away on the parish boundary close to the Waters of Hoy. History fails to record whether this original burial was marked, but, this was far from the end of the story. In 1936 the Robb family from Quoy and a few of their friends were about their peat cutting when they unearthed the corner of a box. Believing that it could contain treasure they informed the local constable who advised them to open it. To their surprise they found the remains of poor Betty, still perfectly preserved by the damp peat. One of the group, Isaac Moar the postmaster, reported their discovery back to the police who duly suggested that they reverently reinter the remains. This they did, marking the grave with a simple wooden cross which they now protected with a picket fence. Unfortunately Betty was not allowed to rest for long. During the war it was discovered that the grave lay in the direct line of some proposed anti-aircraft gun sights. The soldiers carefully removed her coffin, carrying it to a point some 50 m away. During the removal one curious soldier inspected the remains and, like the previous finders, was surprised to see that they remained incorruptible. A few days later, during a bout of jollification, the tale was told in the soldiers quarters. A group decided to exact a joke on their superiors and, returning late at night to the site, exhumed the body, propping it up in the officer's mess at the head their table table. The officers, quite rightly, were not amused. Although this action was never publicised there were severe internal repercussions and the perpetrators were strongly reprimanded. The cadaver was quietly returned, and, to ensure future sanctity, a large stone slab was placed over the grave. In 1949, an American minister, the Reverend Kenwood Bryant, was on Hoy as part of his PhD. Moved by the sight of the simple cross and the background history, he asked Mr Harry Berry, a customs officer, to fabricate a proper headstone. This Mr Berry did after his retirement ... some 27 years later. The boggy nature of the ground caused complications however, and to erect a traditional headstone would have meant moving Betty to firmer ground. It was decided that, as she had suffered enough, a fibreglass one would suffice. So, some 200 years after her original interment, a simple service was enacted over the grave during which it was expressed that all now hoped that Betty would be able to rest in peace. The grave, a notable Orkney tourist stop, lies some 25m away from the road between Lyness and Rackwick just before it reaches the Waters of Hoy.